If the balloon-folding industry faces a worker shortage, good news: It needs look no further than the Stillwater state prison to gradually fill its ranks. The same thing used to be said for welders, cabinetmakers and construction workers. In times past, many Stillwater inmates got hands-on training in those fields and, according to several sources, often went right to work post-release. But that was before Corrections Officer Joseph Gomm was murdered in a Stillwater prison workshop last July. After that, most industrial training there came to a halt — because it necessarily involves inmates working with tools. Gomm was murdered by an inmate with a hammer and a homemade knife, according to the criminal complaint against his alleged assailant. Gorman was interviewed Feb. 6, minutes after an unprecedented House Corrections subcommittee hearing at the prison. Balloon-folding has value, he said — it gives offenders a small paycheck and something to do outside their cells. But it won’t translate to new career once they leave. Still, for now, it’s the best hands-on job program that staff can safely be provided given current staffing levels, Gorman said. 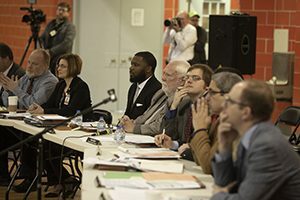 That was a primary theme of Wednesday’s hearing, an echo-laced affair held on one end of a basketball court. Hillyard told visiting politicians that 30 open staff positions are unfilled at Stillwater. That’s partly because of the economy, he said: With low unemployment, becoming a prison guard is not high on most people’s list of jobs. But the problem also has to do with funding, Hillyard said in a separate interview. Those 30 open positions represent a fraction of the true needs, he said. To offer all the programming prisoners need to transition safely back to communities, he said, 91 new officers are needed at Stillwater, in addition to the 30 unfilled slots. To officers, “programming” also means their own interactions with inmates. Corrections staffers are surrogate fathers, brothers, moms or sisters, Hillyard said. When an inmate’s dog dies while he’s stuck inside the walls, it’s tough on him. But he’s less-than-likely to get sympathy from other hard-as-nails inmates. 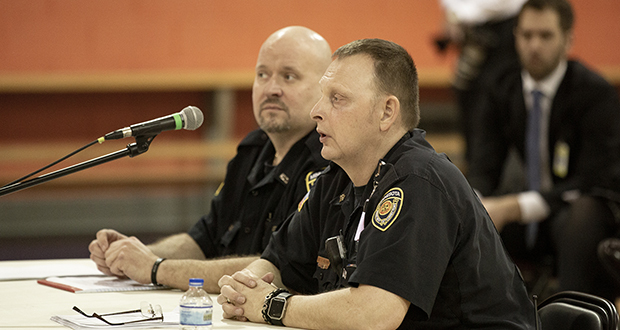 That leaves officers as the only people around to help inmates get through tough personal moments, Hillyard said — except when they aren’t around. If an inmate takes ill or gets injured in a fight and needs hospital care, two officers must accompany him and stay until discharge. It’s not unusual for several inmates to need treatment simultaneously, he said, so upwards of a dozen corrections officers might go missing on a given shift. When that happens and enough off-duty officers aren’t available to fill the gaps, fewer guards are there attending inmates. That can have deep reverberations, said Jeff Vars, a corrections officer and president of the Oak Park Heights prison’s local AFSCME union. If staff is short, an inmate who was promised a chance to attend an education class might be denied. Another offender might lose his only immediate chance to visit the yard or spend an hour in the gym, Vars said. To maintain security, staff might have to renege on a promise to let an inmate phone home for his father’s birthday and instead keep that prisoner in his cell. When it does, things can get violent. That happened in 2018 at levels not seen in recent memory. During the 2018 fiscal year, disciplinary punishment for inmate assaults on corrections staff statewide was handed out 120 times (disciplinary action is called a “conviction” internally, but it does not involve the courts). There were 74 such convictions in 2017 and 63 in 2016. As of Dec. 31, 2018, 59 punishments were meted out for inmate-on-staff assaults during fiscal year 2019. Attacks have not ceased. “We just had two assaults in the last couple of days here at Stillwater,” Hillyard told committee members. Nor are prisoners immune. Since 2014, internal convictions for inmate-on-inmate assaults has hovered at around 400 per year statewide. (There were 856 in 2013.) As of Dec. 31, there were 144 for the current fiscal year. Altogether, Department of Corrections data shows, there were 766 internal convictions for inmate-on-staff assaults from 2013 to the end of 2018. During that same span, inmate-on-inmate attacks resulted in 3,851 convictions. Hillyard and others — notably Rep. Nick Zerwas, R-Elk River — blame the upsurge in staff assaults on a “stepdown program” instituted by previous Commissioner Tom Roy. Roy capped a prisoner’s maximum stay in segregation units to 90 days. But he instituted the program without sufficient staff or training, Hillyard said. Current Corrections Commissioner Paul Schnell acknowledged that the program’s rollout was flawed but he defended its goals. While the current administration is working to develop a better plan, Schnell said, it will continue to take account of the negative mental health impact of extensive inmate isolation. In fact, Schnell told committee members, his management team is working on a holistic goal-setting plan, which will try to better protect the safety of officers, inmates and the public at large. Among other things, that plan will pitch a series of prison population reduction ideas. He said those will include “creative and effective, meaningful, community-based interventions” for probationers, to help keep them out of prison on mere technical violations. That’s good news to Lenelle Maurice Martin, a Stillwater inmate and reporter for the Prison Mirror newspaper, who attended the hearing. In an interview, Martin said technical violators create problems on the cell blocks because they are frustrated people who have no business being confined. Nothing was decided at the committee hearing, which was a fact-gathering session. Schnell did commit to seeking more money to shore up depleted staffing, but he did not say how many hires he will seek. In an interview, Schnell remained silent on how much staff he thinks he and Gov. Tim Walz’s administration might ask for. But he suggested it might not be quite as many as union leaders want. Walz is due to release his budget request for all of state agencies, including the Department of Corrections, on Feb. 19. Twins want $500 million….no problem. Vikings want $500 million…no problem. Hey Gov – you’re job is Public Safety and Judicial adjudication…..not creating jobs. Get to work.